This great book teaches writing, letters and animal names. 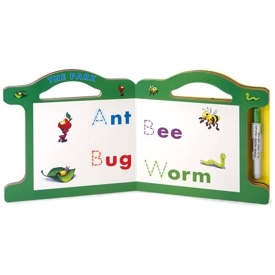 Write, spell and play while you learn about animals. With write and wipe-off elements on every page, this interactive book featuring LeapFrog characters gives preschoolers a multi-sensory way to learn and write about the world around them! Children can look at pictures of their favorite animals...cow, dog, cat, and more. (24 animal names altogether)..and trace their names with a wipe-off pen attached to the book. The top of the book features a diecut handle so kids can carry the fun everywhere. This book has been developed in association with early learning specialists at LeapFrog and at Scholastic.